It was Tobie who first started looking for the books of The Strain Trilogy, which was a bit of a rarity since Tobie doesn't read as many fiction books as I do. He takes a bit longer to do so, but when it comes to RPG books, he gobbles them up like nothing else. So when we did pick up a copy, I left it to him to eventually read them, although I was still a bit curious. Fast-forward to today and by now must of us know that The Strain is being adapted into a TV series by FX. And so I feel I'm back at that tricky point in the book world when you want to read the source material before the TV or movie adaptation comes out. And so I opted to borrow Tobie's copy of the book (which ironically he still hasn't finished) and added it to my own reading queue. This is not my typical book fare given my general discomfort with horror. I scare rather easily, I must admit, and so I don't do too well with TV shows and movies with this tone. For similar reasons I haven't focused on such books since at the end of the day the biggest driving force for fear is our imagination and how the mind runs wild to fill in the gaps of our understanding of a story, leading to more fearsome images. But despite my personal aversion to the subject, this was still a pretty compelling book. 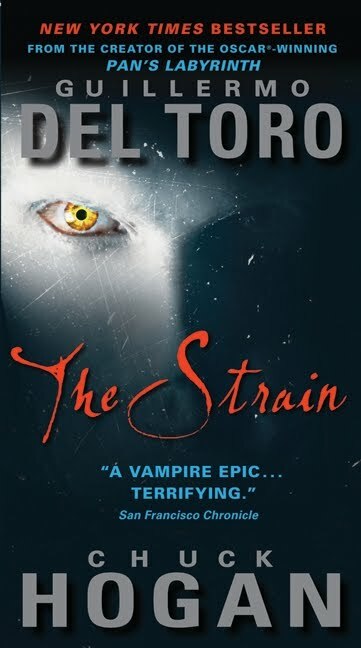 Synopsis: The Strain is a vampire horror novel written by Guillermo Del Toro and Chuck Hogan. Del Toro had initially envisioned this story as a TV series, but no one was willing to pick up the project. So he went on to write a trilogy of books about, and now those books have been picked up by FX to be adapted for television. Irony. And did I mention there's also a graphic novel series? The story starts with a pretty dramatic event - a Boeing 777 arrives at JFK Airport in New York but then soon stops dead on the tarmac. All lights shut off and all window shades of the plane have been drawn. The pilots stop responding to hails from the air traffic control tower and eventually rescue crews are sent to investigate. But when they do breach the plane, there are not prepared for what they find - that it appears that every single passenger on the plane is dead. Thus the CDC is called in given it appears like some sort of gas attack and thus we meet Dr. Ephraim "Eph" Goodweather, head of a rapid-response disease assessment team known as Project Canary. And when he and his colleague Nora do board the plane in full protection gear, they are baffled by the lack of typical signs of an infection or other agent rapidly spreading throughout the plane. Eventually they find that a pilot and three other passengers somehow managed to survive - but there is no clear answer as to what they had survived. Even if I didn't know that The Strain was originally meant to be a TV series, the pacing of the book alone certainly presented that vibe. The book is divided into quite a number of segments that are further broken down into chapters of a sort. And thus you can tell where one could potentially end an episode for appropriate cliffhanger moments. And there's the fact that the book has quite a lot of visual descriptions of each scene and what's going on. Thankfully character development doesn't quite suffer in that regard - the descriptions work together with the revelations about each person to a good degree. But this is sort of balance by how this is definitely a plot-driven adventure and not necessarily a character-based one. So the characters have enough back story t fit this mold, but not much beyond that. This is neither good nor bad - it's just appropriate to the goals of the novel. All that window-dressing aside, the best part about this story remains to be the highly biological concept Del Toro came up with for vampires. Instead of all the usual mystical themes that have been tied to vampire lore over the years. Instead the Vampires of The Strain are patterned after virus behavior - this includes the biological mechanisms that take over the host body and compromise those systems, push the need to spread the virus even further, and other behaviors. But at the same time, there's no mistaking that they're vampires given them being undead, the craving for blood, and of course them being totally creepy. The book is really a rather long setup piece, one that focuses on establishing how these vampires work, the limited history related to them, and of course the slow spread of the vampires throughout New York. I felt that we didn't necessarily have to spend this much time on the stories of people being turned one by one, but at the same time it was clear that they had no intentions of progressing the story too far beyond a certain point in this first book. That sort of warped the pacing for the book, but I can understand the necessity for it - I'd do the same thing if I had a definite plan for which plots points were going to belong in which part of the trilogy. The Strain presents a highly interesting premise and a great biological spin on the classic vampire concept. It has Del Toro's fingerprints all over the narrative and terms of how things progress and how the characters are presented and I can only hope the rest of the series holds up just as well. Thus the book gets 4.5 creepy vampire words hidden in the blood out of a possible 5.